"My husband and I wish to extend our heartfelt thanks to you and to your staff, specifically Freddie, for being so helpful to us in our time of grief. 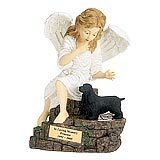 As you know, we recently lost our precious Nikita and her ashes joined her sisters in an existing Angel Ashes Memorial Urn. We wanted a new plaque to include her name and a larger frame so we would be able to put a picture of both our girls in it. The redesigned plaque is beautiful and just perfect. The new frame now holds a picture of both our girls. 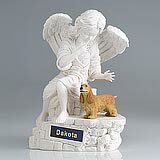 You and your staff are always kind and patient with grieving parents of fur babies and I just wanted to say Thank You. 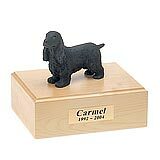 You provide a wonderful service and an outstanding product. There is nowhere else on earth I would want my kids to be but in their beautiful Angel. Thank you again and please extend our thanks to Freddie as well as he was very patient and kind when speaking with me." 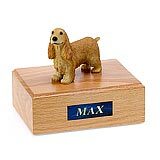 All available English Cocker dog urns and memorials will be displayed with the figurine on the English Cocker urn you select and in the appropriate size.